Steel-eyed, sober, often grim and frequently dangerous, Ed Harris has carved a niche for himself portraying characters who can be flawed or misdirected. Whether he’s playing an earnest astronaut (John Glenn in The Right Stuff) or a scarred gangster (A History of Violence), his parts are rarely less than formidable. 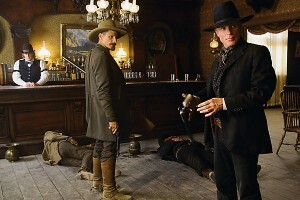 It’s no surprise that Harris … Continue reading The Next Classic Buddy Film Director/star Ed Harris and author Robert B. Parker give us an inside look at Appaloosa.